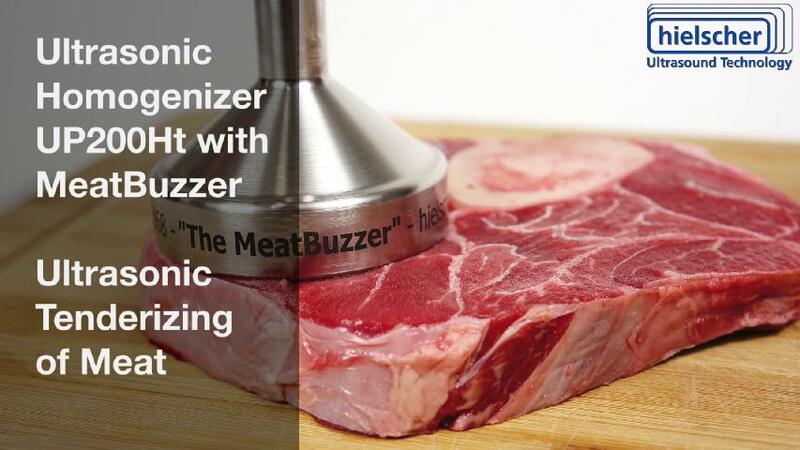 Ultrasonic tenderizing of meat is a quick and easy mechanical method. Ultrasonic tenderization is successfully used in kitchens and industrial processing lines. compact sonicators for the easy and convenient tenderization in restaurants. high-power ultrasonic systems for the integration in industrial processing lines. Tenderness is the most important quality feature of meat. Meat tenderness is affected by composition, structural arrangement and the composition of the skeletal muscle. The traditional pounding of meat is used in order to make meat of less quality more palatable. Tenderization can be achieved mechanically (e.g. pounding, piercing), thermally (by cooking, grilling, braising) or enzymatically. 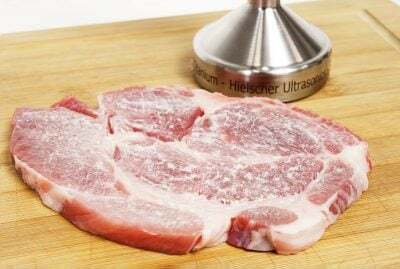 High power ultrasound is a novel mechanical method to tenderize meat, such as beef, lamb, pork, poultry. 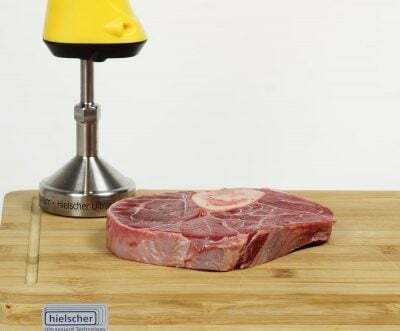 Ultrasonic treatment results in improved eating texture of meat, since ultrasonic cavitation breaks the perimysal connective tissue and makes the structure tender and soft. The ultrasonic device UP200Ht is powerful 200W tool for the tenderization of meat. For optimal results, Hielscher offers sonotrodes with a large surface. The sonotrode is moved with slight pressure over the meat. 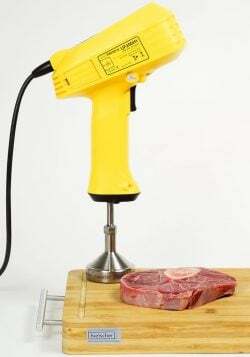 The comparative analysis of the meat quality was measured with a Warner-Bratzler shear (WBS) device. Under sonication with an intensity 12W/cm2 for approx. 60sec the hardness and texture of the meat is comparable to that of meat aged for three to five days. This basic protocol can be easily adapted to other meat types and cuts. The ultrasonically assisted meat tenderization is based on the principles of cavitation. By ultrasonic cavitation, (1) the muscular cells are broken and myofibrils are separated and (2) naturally present enzymes are stimulated. Ultrasonic tenderizing effects are caused by the collapse of cavitation bubbles. These collapsing bubbles generate locally very high temperatures and pressure shockwaves as well as micro-streaming, which occurs with high shear forces. These effects can accelerate the transport of substances to and from enzymes, and enhance mass transfer in enzymes, increasing thereby enzymes’ catalytic efficiency. Ultrasonic cavitation creates intense shear forces. This means, ultrasonic tenderizing and the physicochemical change of meat structure is obtained due to mechanical effects only. Sonication is a mechanical method to tenderize meat by breaking down the meat collagen. Collagen is a protein abundantly found in muscles and gives meat its texture. The higher the collagen content, the stiffer the meat. In order to obtain a tender, palatable steak, it is often required to tenderize the meat. By sonicating meat, myofibrils are separated and collagen is solubilized: Sonication reduces the denaturation temperature of collagen in the muscular tissue of meat since the ultrasonic waves change the conformation of muscle proteins and cause the fragmentation of collagen macromolecules. Ultrasonic cavitation treatment can rise the pH value of meat significantly. Meat with a higher pH value shows a significantly higher moisture retention capacity. Meat with higher moisture retention capacity looses significantly less weight during cooking, grilling or drying. Background: After slaughter, the pH value of the meat drops since the glycogen is converted into lactic acid. The pH value is an important factor for the quality of the final meat products. If the pH value falls to too low, the proteins get denaturated. The pH value of meat increases significantly after the ultrasound treatment. This uprise of the pH value is caused by the release of ions from the cell interior into the cytoplasm and a change in the protein structure. Besides its tenderizing effects, sonication promotes the marinating of meat. By ultrasonic disruption of muscle tissue, cell structures get opened so that marinades and spices can penetrate deeply. Ultrasonic marinated meat can hold more marinade and juice resulting in more intense flavors and overall improved eating quality. For the use of ultrasonics in gastronomic kitchens, Hielscher recommends in particular the powerful and robust 200W ultrasonicator UP200Ht. Equipped with a special sonotrode for meat tenderization, the handheld UP200Ht is a compact and very user-friendly device for culinaric applications. Click here to learn more about further applications of ultrasound in the kitchen! For the commercial meat processing Hielscher offers industrial systems, which can be easily integrated into existing processing lines. Contact us today with your details of your meat tenderizing application! We will be glad to recommend you a suitable ultrasonic solution. Jayasooriya, Sriyani; Bhandari, Besh; Troley, Peter; D’Arcy, Bruce (2004): Ultrasound in Meat Processing. MINTRAC, March 2004. Jayasooriya, Sriyani; Torley, Peter; D’Arcy, Bruce; Bhandari, Besh (2007): Effect of high power ultrasound and ageing on the physical properties of bovine Semitendinosus and Longissimus muscles. Meat Science 75/4, 2007. 628-639. Nishihara, Tomio; Doty Paul (1958): The Sonic Fragmentation of Collagen Macromolecules. Proceedings of the National Academy of Sciences of the United States of America Vol. 44, No. 5 (May 15, 1958), pp. 411-417. Mason, Timothy; Paniwnyk, Larysa; Chemat, Farid; Abert Vian, Maryline (2011): Ultrasonic Food Processing. In: Proctor, Andrew (Ed. ): Alternatives to Conventional Food Processing Vol. 1; Royal Society of Chemistry, 2011. p.402ff. High-power ultrasonics promotes the brining of meat, too. The ultrasound waves accelerate the brine penetration into meat. Thereby, NaCl content, water content, and water-binding capacity are increased . The thoughness and cohesiveness as well as gumminess are reduced, too – resulting in a significantly improved quality of the final meat product. Ultrasonic brining reduces the processing time whilst improving product quality. Collagen is an important constituent of meat. It makes 1 – 2% of muscle tissue. In strong, tendinous muscles approx. 6% of the weight comes from collagen. Collagen is an important structure-building component. It is the main structural component of connective tissue and is responsible for its tensile or stretching capacity. Collagen comprises approx. 40 different protein types but there are four types that are most common (collagen type I, II. III, IV). When collagen is irreversibly hydrolysed, gelatine is obtained. Gelatine is widely used as gelling agent in many industries (e.g. food, pharma, nutraceuticals, cosmetics, photography, etc.). Papain and bromelain are the most commonly used enzymes for meat tenderization. Papain is derived from the papaya fruit, whilst bromelain is found in the pineapple plant. Actinidin, contained in kiwifruit, and ficin, an enzyme from the fig tree latex, are known for its tenderizing effects too, although their use is not widely spread in the industry. Meat quality is mainly determined by meat tenderness, colour and marbling (intramuscular fat quantity). Meat quality is heavily influenced by the muscle structure (including intrinsic structure such as sarcomere length, myofilament diameter, and fiber types) as well as its composition (moisture, fat, protein, ash and collagen content). Meat can be broadly classified as red or white depending on the myoglobin concentration in muscle fibres. Myoglobin is an iron- and oxygen-binding protein and is related to hemoglobin (the iron- and oxygen-binding protein in blood). When myoglobin is exposed to oxygen, reddish oxymyoglobin develops, making myoglobin-rich meat appear red. The redness of meat depends on species, animal age, and fibre type: Red meat contains more narrow muscle fibres that tend to operate over long periods without rest, while white meat contains more broad fibres that tend to work in short fast bursts. Meat of cow (cattle, beef, bulls, bovine), sheep, lamb, and goat is classified as red, while pork (porcine), poultry (chicken, turkey) and fish is considered white meat. Meat can be further classified by its cut and preparation, e.g. aged meat (dry-aged), bacon, barbecued, braised, burger, charcuterie, chop, corned, cured, cutlet, dried, fillet / supreme, fried, grilled, ham, kebab, liver, luncheon meat, marinated, meatball, meatloaf, offal / guts, pickled, poached, roasted, seared, salt-cured, salumi, sausage, smoked, steak (sirloin, tenderloin, NY strip, ribs, filet mignon, brisket), stewed, tandoor, tartare, veal etc.